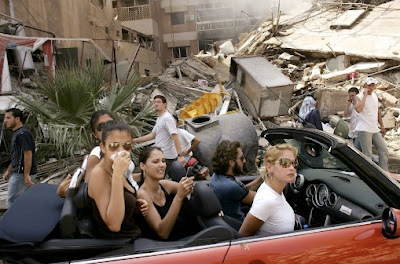 One of my favourite images from last year was Spencer Platt's photo taken in southern Lebanon during the Israeli bombing campaign - modellish looking women drive past a bombsite in an open top car. The picture came first in the World Press Photo awards. Checking out the site today, I was pleasantly surprised to see that World Press Photo has been partnering with the Nigerian Institute of Journalism in offering a 4 month-long course on photojournalism. Click here to find out more. It would make a change from the drab non-descript pictures that fill newspapers in Nigeria. Front page pictures are always shots of people having meetings. How drab... Funny enough, the sports photographers tend to get much better pictures.